Soups often contain gluten and dairy, two items which our family tries to avoid due to allergies. 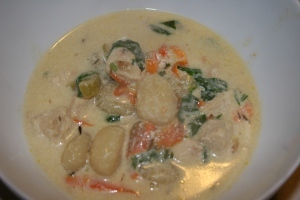 This Chicken and Gnocchi Soup had all of the wonderful taste without any hint that it was allergy friendly. It has become a family favorite. Saute onion, garlic, celery, and carrot in the oil. Add chicken, chicken stock, almond milk, salt, pepper, and thyme. Bring to a gentle boil and add gnocchi. Boil for 4 minutes. Add spinach and cook for 1-2 additional minutes. Enjoy! 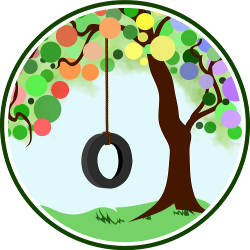 This post has been edited from a previous version posted on Living Peacefully with Children. Love gnocchi and love chicken soup – but never heard of it together like this! Will have to try – thanks for sharing!! just to be clear this is not “paleo.” The gnocchi has corn starch, rice and other kinds of ingredients that are not considered paleo. No, this recipe is not paleo and is not listed as such. The recipe is dairy free and gluten free if you make or buy gluten free gnocchi. Ours is also corn free, as we do not use cornstarch.